London: Victor Gollancz LTD, 1985. This is the first British edition of The Ghostway. This edition is a hardback with a full dust jacket. The back of the dust jacket contains a list of "some recent Gollancz thrillers." 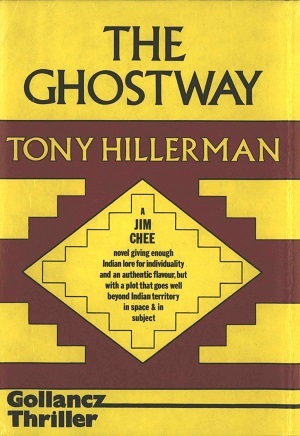 This is the sixth book in Tony Hillerman's Navajo Mystery Series, The Ghostway, is the third novel to feature the protagonist Sergeant Jim Chee of the Navajo Tribal Police. Format: Hardback, 20.2 x 13.4 cm. Binding: Deep red boards with spine lettered in gold: [horizontally] THE | GHOST- | WAY | by | Tony | Hillerman | GOLLANCZ. Illustrated paper dust jacket printed in black, brilliant yellow and deep red.